Picking good stocks has always been a very difficult task; however this can be made simpler to some extent with the help of some financial ratios which are the reflection of the financial & operational strength of the company. 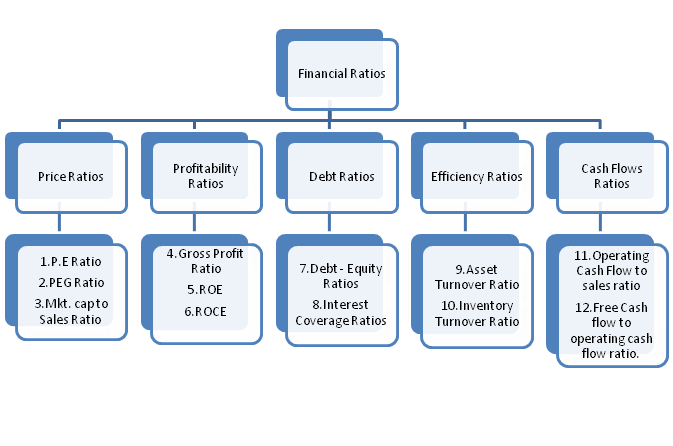 Here are 12 financial ratios upon which every Investor should analyze companies before making any Investment decision. Price-Earning (P.E.) Ratio: To begin with popular one, P.E is an indication of “how many times of EPS is the price of share quoted”. In simpler words, it indicates how much Investors are ready to pay for each rupee of earnings. A high P.E ratio indicates that the stock is overpriced. It depicts that investors are ready to pay excessive for its each rupee of earning the reason being future prospects, growth or any positive developments. Often these expectations are more intense which are unlikely to be met by companies. What do you expect when the markets realize this ?? To be on safer side one should go for low P.E companies. Low P.E may be different for different industries, for eg. A P.E of 20 may be expensive for any textile company whereas the same is cheap for any I.T company. P.E ratio shall therefore provide a better picture if compared with industry P.E. Also, it should be used with other financial ratios for better decision making. PEG (P.E to growth) Ratio : One Major drawback of using P.E ratio is that it is only based on current earnings and do not take into account the growth potential of the company. To rescue the same, one should also use PEG ratio along with P.E ratio. Lower the PEG ratio, the better stock is valued. Usually PEG<1, is considered as an attractive investment opportunity. Although Company B has a higher P.E but the same is compensated by higher anticipated growth..i..e.. the earnings of the company are expected to increase at a greater pace resulting in higher EPS. If there is higher EPS, P.E ratio will be justified in future (think of impact on P.E. ratio in future) whereas in case of Company A its lower growth will not be able to justify a P.E. of 20. You might be wondering how to compute growth rate?? Use EPS of previous 5 years and compute compounded annual growth rate (CAGR), but this is past growth rate and future is uncertain, therefore calculate range of values for a better picture. Like what will be the PEG ratio “if same growth rate prevails”, “if growth rate increases by 10%”, “if Growth rate reduces by 20%”. DRAWBACKS: PEG ratio shouldn’t be used for cyclical companies. Like in case of sugar industry, sugar companies have reported a spectacular growth rate in EPS for past 2 years but the same cannot be expected to continue in future. Therefore we cannot anticipate approximate growth rate here. Hence, using past year EPS figures will always provide irrelevant results. Anticipating growth rate is always a difficult task and one cannot get it right every time. Market Cap to Sales ratio: Also Known as price to sales ratio, it indicates how the market is valuing every rupee of company’s sales. It can also be used as an alternative for P.E for the loss making cyclical companies. Low debt with market cap to sales below 1 is considered attractive investment opportunity in case of such companies. Gross Profit Ratio: The reason I prefer Gross Profit Margin Ratio over Operating profit Margin (OPM) & Net profit margin (NPM) is its reliability, OPM & NPM are comparatively easy to manipulate. It tells us how good a company is in manufacturing its products when compared to peers. More efficient companies see higher GP margins; it reflects that they have been able to figure out a way to reduce its cost of goods sold. Return on Capital Employed (ROCE): ROE may not be suitable for companies with heavy debts, as the moneys flow not only by means of equity but also from financial institutions in form of debt, therefore it makes sense only when return on entire capital employed is computed instead of equity. Debt-Equity Ratio: It indicates the extent to which shareholder’s equity can meet its current & non-current liabilities in case of liquidation. Generally a debt equity ratio below 1 is considered better, however this depends upon industry to industry, like a capital intensive company may have DE above 2 whereas the same may be lower for any service sector company, therefore it is always better to compare DE of a company with its peers. High debts not only make it difficult to raise further funds to meet business requirements but also affect the Net profit Margin & EPS severely. Moreover, companies with higher debts will find it difficult to survive in recessions due to higher interest expense burden. Interest Coverage ratio: It reflects the company’s ability to pay off interest on its outstanding debt. In other words, it indicates whether the business has earned sufficient profits to pay periodically the interest charges. The interest coverage ratio is a measure of the number of times a company could make the interest payments on its debt with its EBIT. The result should be compared with that of peers to arrive at better conclusion. Like with most ratios, the asset turnover ratio is based on industry standards. Some industries use assets more efficiently than others. To get a true sense of how well a company's assets are being used, it must be compared to other companies in its industry. Inventory Turnover Ratio: Inventory turnover is an efficiency ratio which calculates the number of times per year a business sells and replaces its entire batch of inventories. Inventory turnover is a very industry-specific ratio. Businesses which trade perishable goods have very higher turnover compared to those dealing in durables. Hence a comparison would only be fair if made between businesses in the same industry. For Example: If both company A & B operating in same industry has Rs 20 00,000 of average inventory and A can sell it all 10 times whereas B can sell it 5 times in a year, A shall be considered more efficient and will incur lower stock holding & obsolesce losses. Inventory turnover ratio can also be calculated in days, like in above example company A clears its inventory in 365/10 = 36.5 days whereas B clear it in 365/5 = 73 days. Operating Cash Flow to Sales Ratio: This ratio gives the analysts and investors indications about the ability of a company to generate cash from its sales. In other words, it shows the ability of a company to turn its sales into cash. It is expressed as a percentage. Ideally there should be a parallel increase in operating cash flows with the increase in sales. It will be worrisome if the changes in cash flows are not parallel to the changes in sales revenue. It is a known fact that companies can fudge the sales number relatively easily. This can be done by changing the revenue recognition policy which allows accountants to book future income as income today. Sometimes companies do fake transactions to ensure that sales numbers look good to the stock market. However, the acid test comes when sales need to be converted to cash. Only genuine sales bring in cash flow. If this ratio comes out to be 60%, it is read as “the company has been able to realize 60% of sales into cash, which it can use to pay its employees, suppliers, invest in equipment and distribute to shareholders as dividends”. Free Cash Flow to Operating Cash Flow ratio : Free Cash flow is the cash left with the company after meeting its capital expenditures, Free cash flow = operating cash flow – capital exp. Therefore this ratio indicates percentage of cash flow left free out of operating cash flow generated by the company. This “Free” cash flow can be used by the company for expansion, acquisitions and coping up with difficult situations. Thus a higher ratio reflects financial strength of the company. These 12 ratios can be great if used while picking stocks as they try to cover every aspect of the company. Investors can add on other ratios too as per their intellect. The motive is to identify best investment opportunities and exploit them to the fullest. Happy Investing !! !